Today we held the last Wealden area group meeting for 2014. As meetings are on the 4th Saturday of the month, the theoretical December meeting always clashes with Christmas. So the next meeting will split the difference and be held on the 10th January then we revert to the 4th weekend in February. With us so far?? Good - I'll continue. We had a good turn out with Richard, Dave, Gareth, Bob, David and myself present with a few items being worked on. Topics of conversation included the Arnold 5BEL (Richard and Gareth already gloating in posession),the state of the Brighton Line, through tickets and forthcoming exhibitions. Projects being developed included my GWR Mogul, with the splashers being added. I had already turned some cups on the lathe and cutting the splashers out of the circular cups was done during the meeting. The pictures show the machined disc and the last splasher being cut from its partner. 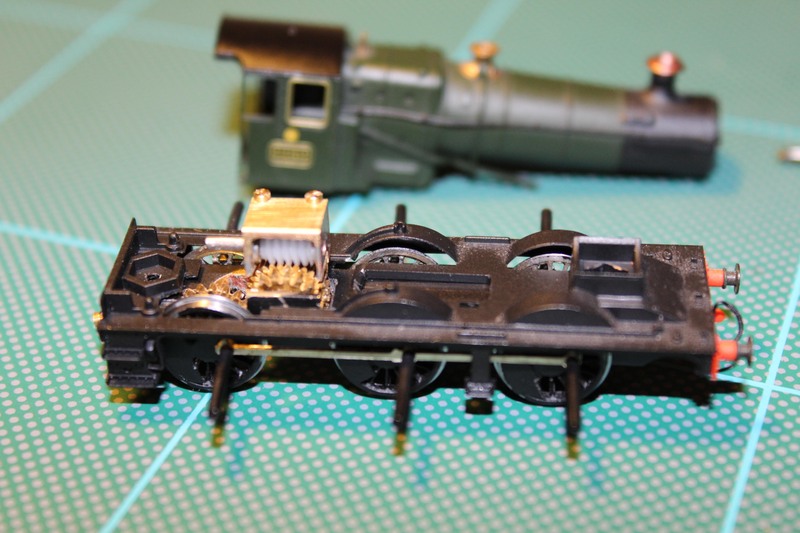 The boiler and firebox are cast resin while the cab and footplate are nickel silver all to fit over one of my Manor chassis kits with suitable afjustments. 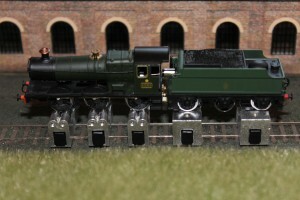 The tender is one of the Dapol items avaiable from the Asssociation shop. 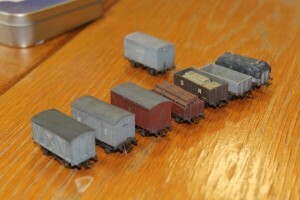 David was working on some early GWR wagons in red oxide. The Western did exist prior to the 20th century and some of the earlier colour schemes were different to those most of us know. 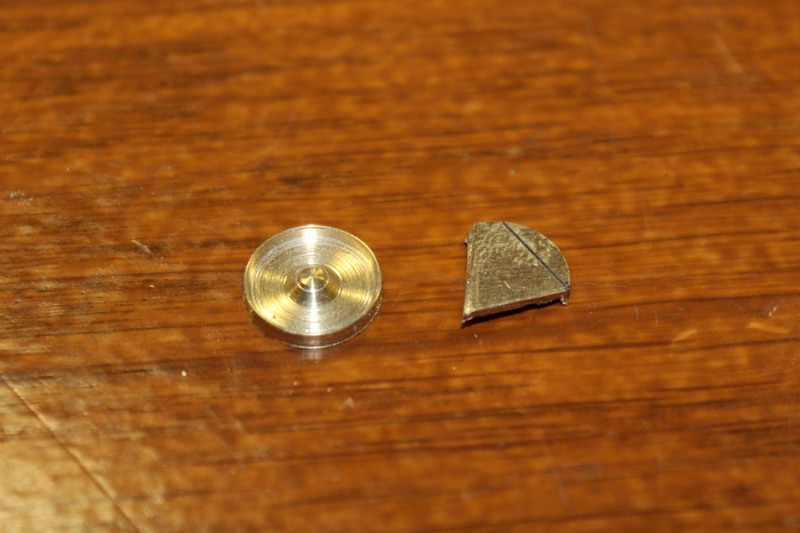 As all this pre-dates living memory and colour photographs David has the ideal answer to any rivet counters. He was using an interesting little vice to steady the wagon body being worked on, as shown in another picture. 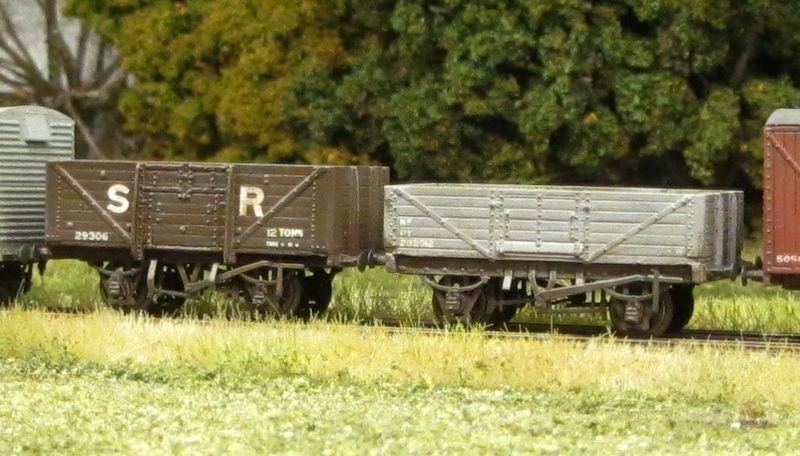 Meanwhile Richard was refining points on some of the wagons referred to in an earlier blog, among other things making new coupling loops. So that was us done for 2014. 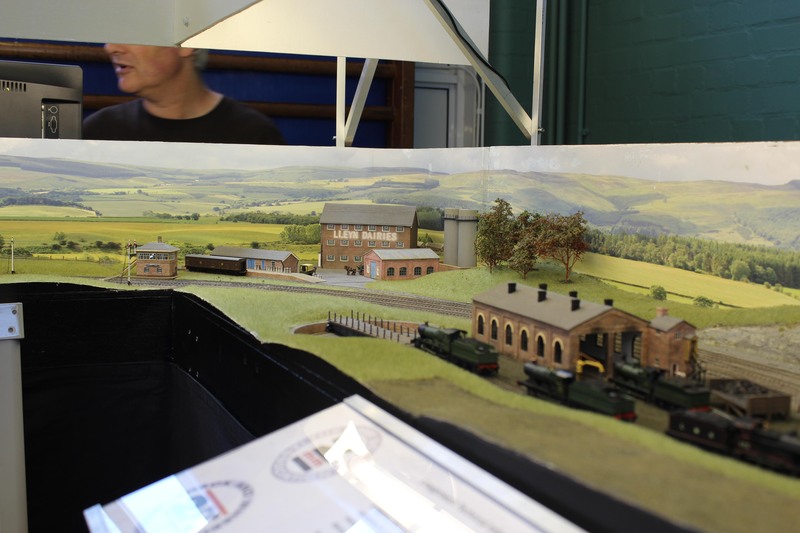 Plenty of time to make modelling progress over the festive season and we'll all congregate back in Uckfield in mid January to share what we've been up to. The pictures are pretty much in the order of the text above. Double click on any picture to see more detail. 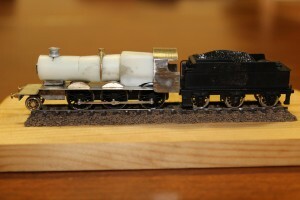 Well all the modelling activity culminating in the production of a second Collett Goods loco did produce a nice runner. First picture sees the running in session on the rollers. I think that was Thursday some time. Today saw a bunch of us at Aldershot for an excellent show and an AGM thrown in for good measure. I took a couple of shots, during the set up phase when a lot of locos were in the shed area - it never got that crowded in normal running. As this was the first time running the layout in its 1930's guise, I feared a degree of finger prodding, but things could have been worse. We found the Jones goods and the two Colletts pretty reliable. The 2p was a little variable, but fine once moving which is a little odd. Tre Pol and Pen had a couple of "moments" but benefitted from tweaks done during the course of the day. 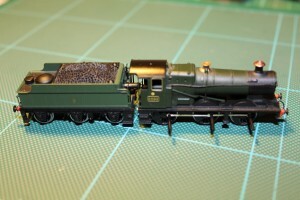 The Pannier pilot proved very able, but I spent a lot more time cleaning and re-cleaning the track throughout the day. I don't recall any real problems with the Manor, but David or Richard may tell you differently. We sidelined the 45xx fairly early, but I do have a plan to improve it soon. A couple of coaches have had running issues, and as usual it is a question of identifying and rectifying these. Only through continuous monitoring will we improve things. Even the diesel stock went through this phase, so I am hopeful of seeing imporovements in reliability tomorrow and at future shows. Anyway, it was good to see so many 2mm Association folk today and share ideas. We need to entertain the general public more tomorrow, so a long clean will be the starting point of the day. Comments Off on It's Show Time! It has been a busy day. I made the most of dry weather this morning to do some outside carpentry to mount the screen we will use to display the timetable to our audience. The screen is an old 15 inch one that my wife used to use before a new widescreen edifice took its place. A frame that allows us to attach it to the front of the layout but angled upwards gives us the ability to display information without distracting too much from the layout itself. David has been doing a large amount of work on the timetable itself based on some real items for Pwllelli - Llangerisech's mythical neighbour! A concoction that is based on a semblance of reality helps us place the layout and lends a sense of purpose. 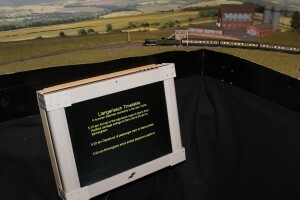 Trains will be shown along with their destination or origin. The first picture shows things mocked up, but gives no idea of the amount of time that David has devoted to researching this and coming up with a workable item. 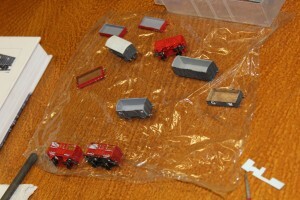 Once back inside, the last bits of the Collett Goods were put together. The tender uses the Association 8mm driving wheels with extended axles, but with the extensions turned down. On the old Manor models, a phosphor bronze strip had indentations in the form of cups, so the extensions were turned to points. 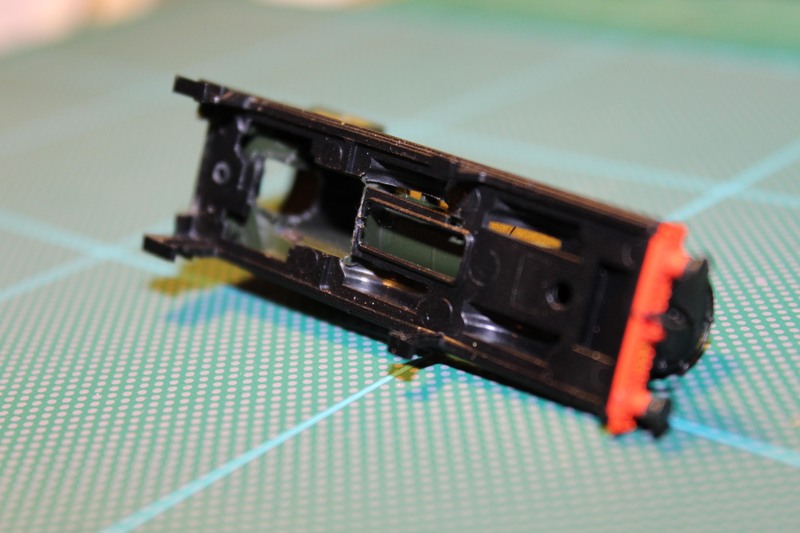 On the newer version fitted to the 28xx and new Manors, the strip has changed to one with holes. The result of this is that the points need to be turned accurately to 1mm diameter. This has the benefit of extra sideplay, but means that a lathe is really needed to do the conversion. However, the lathe time was less than half an hour for me. The chassis and wheels have all be painted, so it was really just a bolt and fit together job. The main advantage of the design is the ability to build then separate the worm carrier, so once the centres are established very little fettling is needed. In fact this one went together first time, so the measurements must have been accurate. The intermediate gear (30:1 plus a 16 tooth gear) was mounted on stub axles and the rear wheels and final gear (20 tooth) mounted then checked. 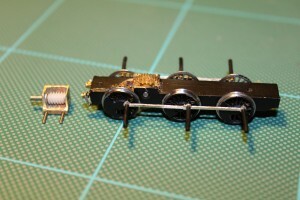 All OK, so the worm carrier could be fitted and the gear train checked throughout. 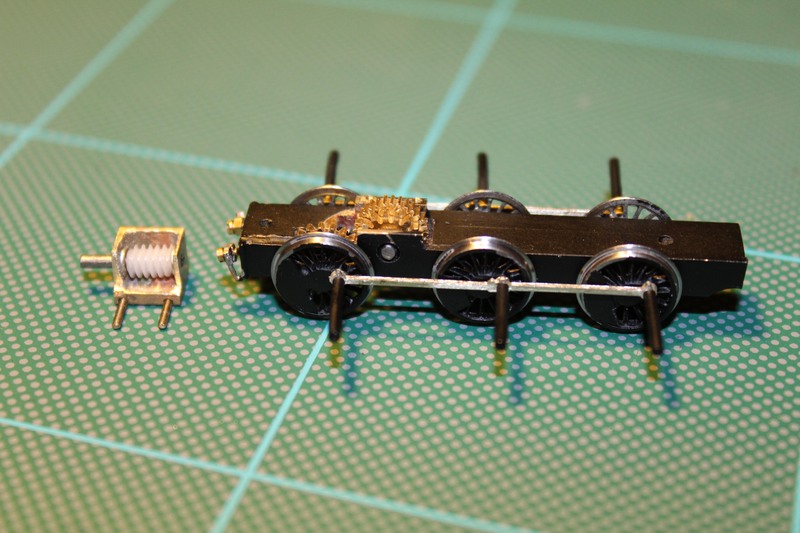 Removing the worm carrier and completing the other axles allows the quartering and coupling rods to be sorted with all the gears turning. The body required some plastic removing from around the firebox area to allow the drive shaft from the tender to pass through. All that remains to do is to finish soldering the crank pin washers, fit the driveshaft and bolt the body on with a new tender drawbar. The final picture is just a dummy - you will have to come to Aldershot this weekend to see if it runs OK! 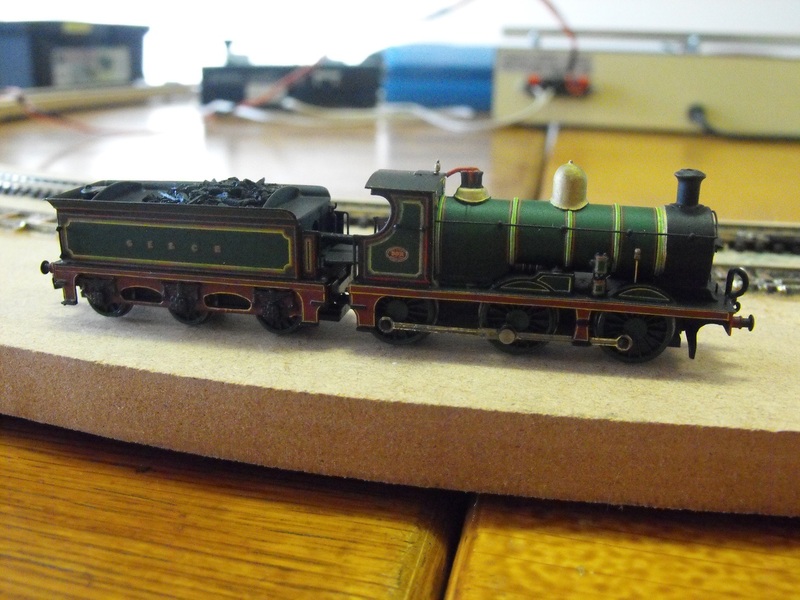 The second Collett goods is coming along nicely and should be ready in plenty of time for next weekend's show. 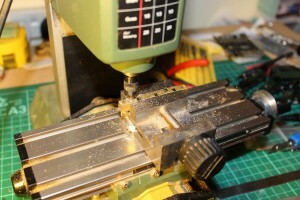 The first photo show the large part of the chassis block being milled out. The front axle clearances are complete and the area around the gear train are in the process of being milled up to the marks. The second gives the fully milled chassis components including the worm carrier and the insulating bushes on the screws which hold the two parts together. 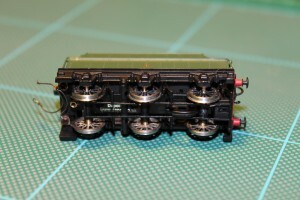 The third picture shows the chassis dry assembled along with the tender axles and the bodies that will be mounted on this concoction. 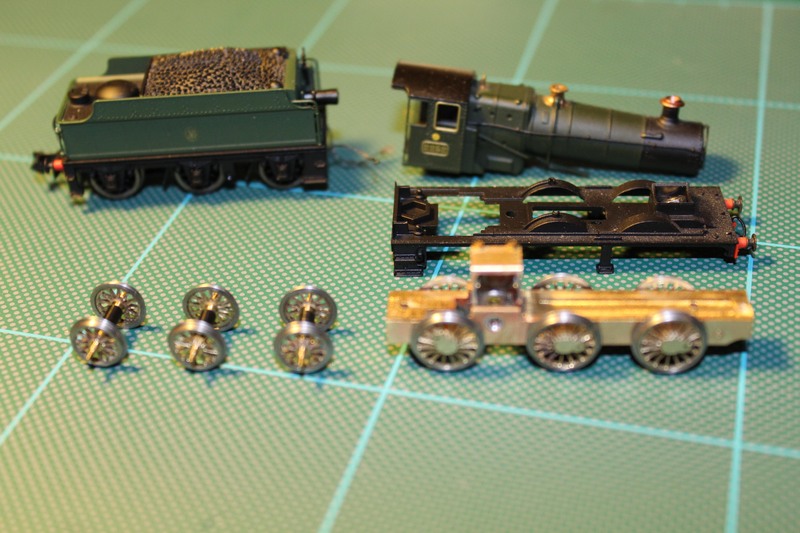 So the balance weights and crank pins need adding to the wheels, the tender axles need turning to points and the gear axles need preparing. After the two chassis halves are bonded and screwed together, everything will be primed and painted before final assembly. Having already checked things against known templates from the first build, I don't predict any nasty surrpises. Once this loco is finished there are some wagon transfers to be finished, coaches to be fettled and some platform furniture to fit before Friday. Nothing like a deadline to ensure progress! 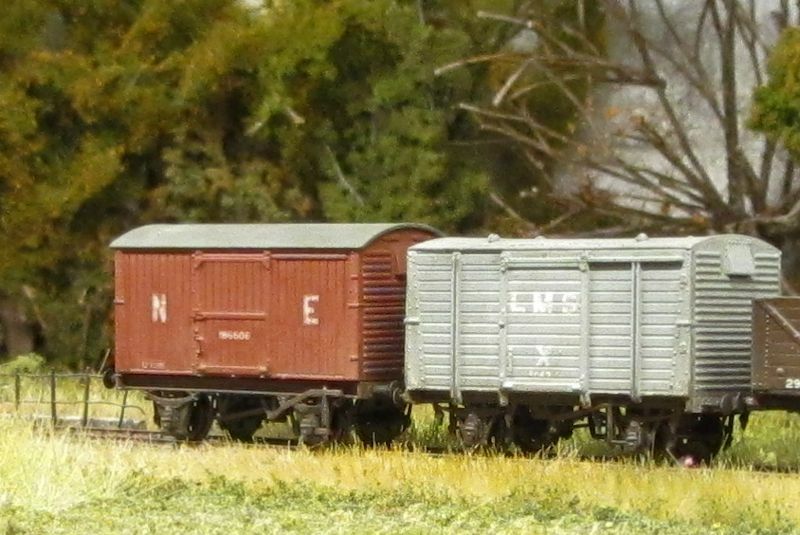 Nigel had set himself quite a task in getting Llangerisech ready in its 1930s guise for the AGM/Aldershot show so, when at one of our area group meetings he said he was running a little low on non-Great Western wagons, David and I volunteered to build a few. Well, how hard could it be? 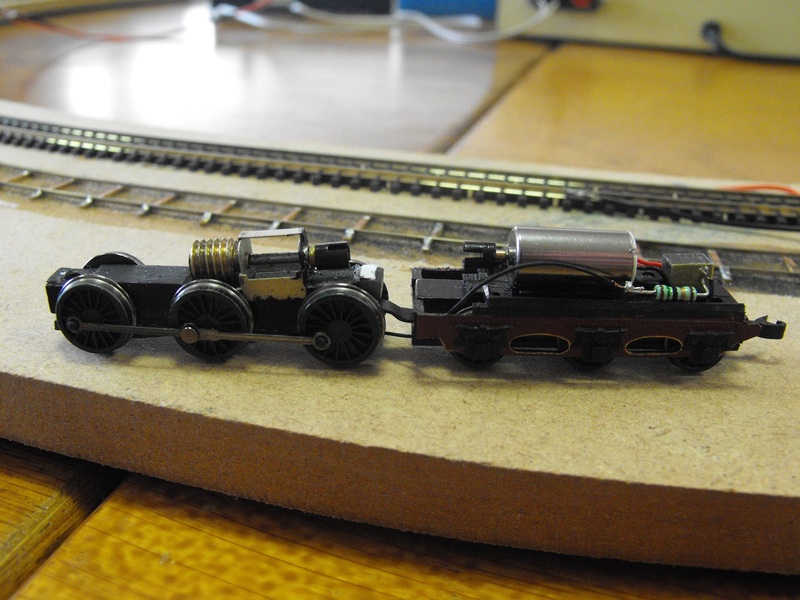 That meeting was at least two months ago and I still haven't quite finished, though the only things outstanding are couplings and a few tweaks. 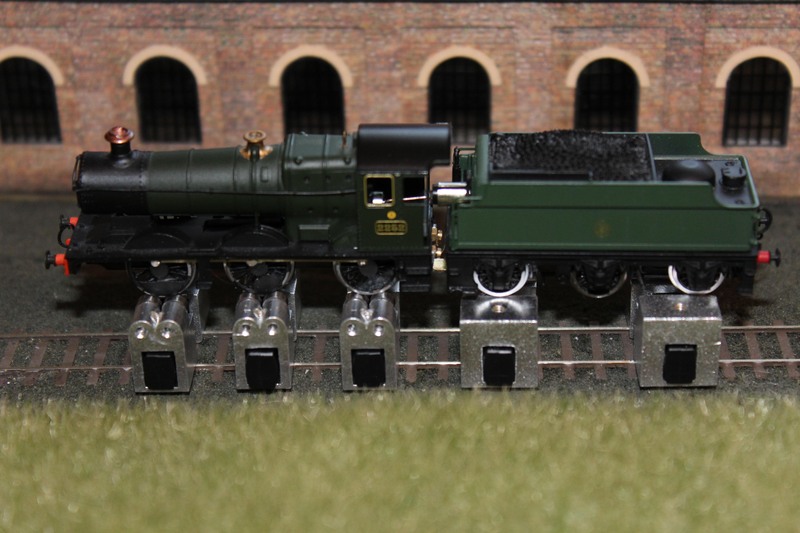 In that time Nigel has re-wheeled a 2P, scratch built a goods shed, finished off several rakes of coaches, plus Lord knows what else! Still, I have learnt a lot, and thanks to my new RSU, I actually enjoyed building kits for the first time. 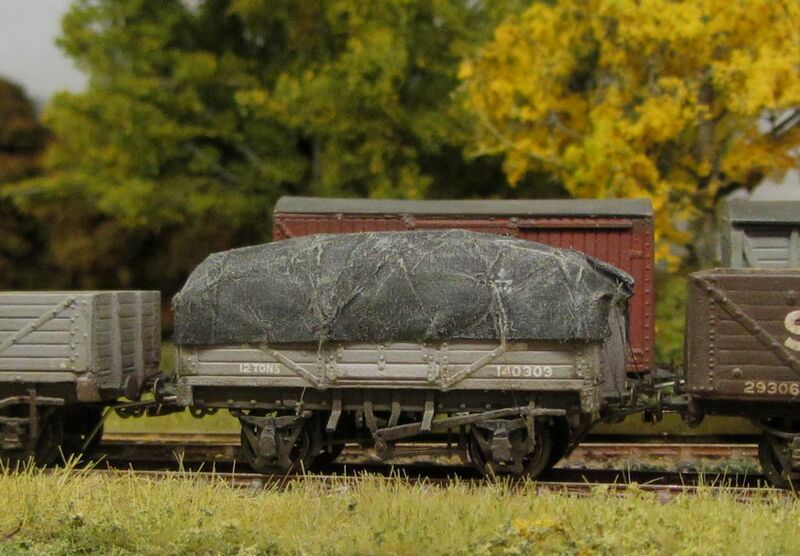 The pictures show the wagons I have built on my scenic test track. I am helping Nigel operate Llangerisech on the Saturday, so if you are going and have any questions please pop along and see us. 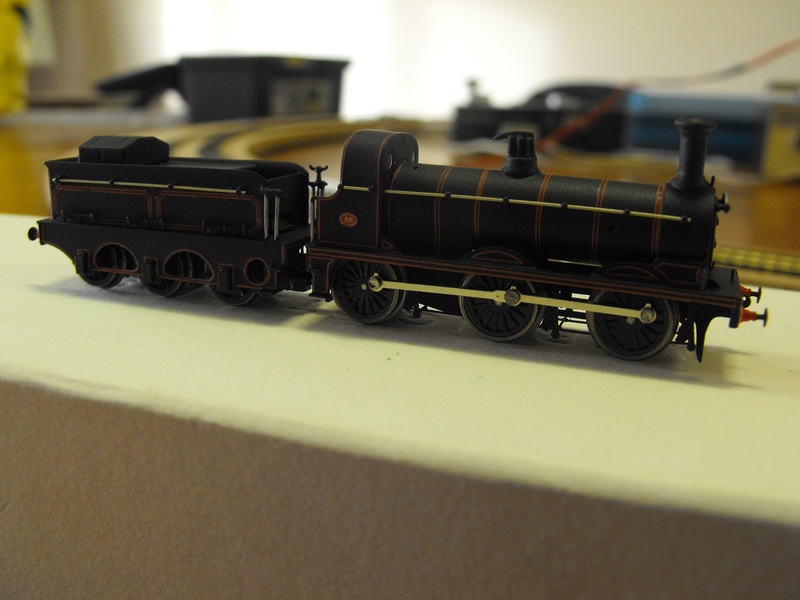 I subsequently rescued a second LNER open that had been put to one side due to me messing up the underframe. 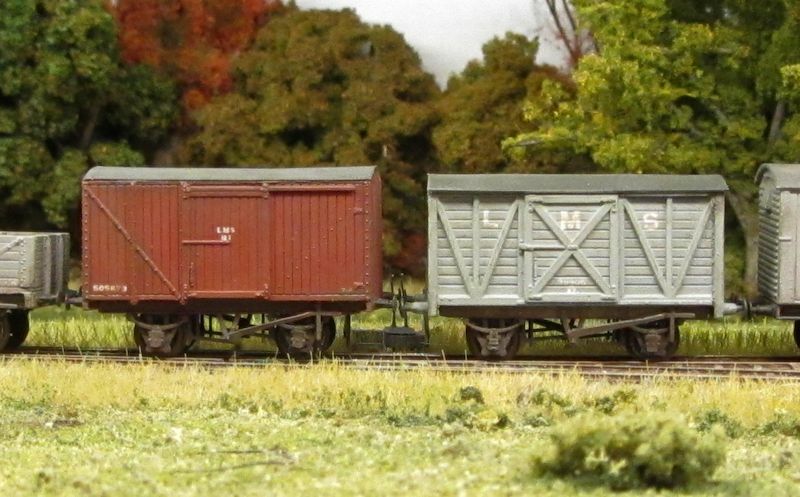 When I had finished the other wagons I found I had enough bits to make a suitable underframe, albeit 10' rather than the 9' I had intended. 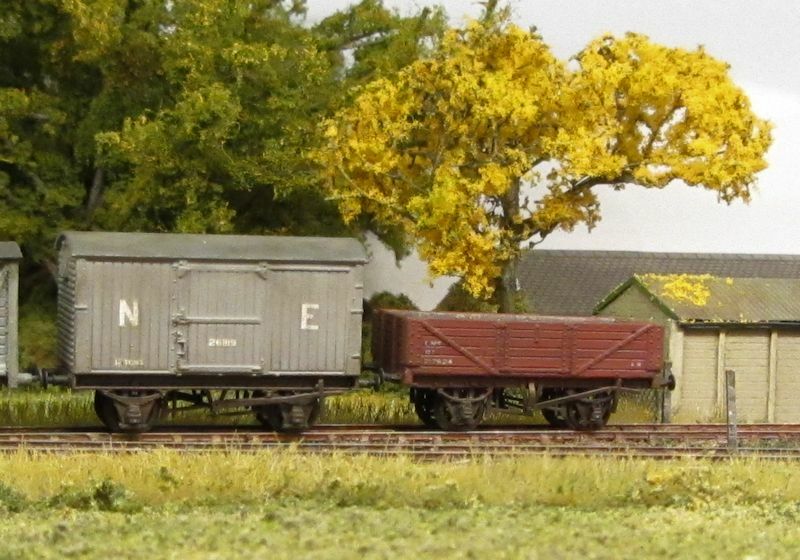 To help distinguish this from the other similar wagon I decided it would get a tarpaulin and the finished model is shown below on its own and with the other opens, a couple of which now sport loads. Evening. Continuing the countdown to the AGM and exhibition at Aldershot on the 11th, here's today's update. No Cambrian layout can ever have too many 0-6-0 goods locos and that's quite handy when looking for building simple locos that run well. 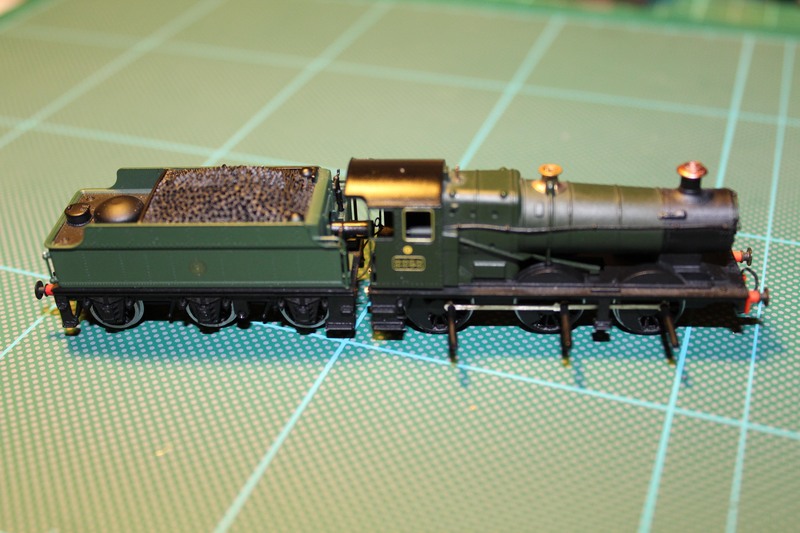 I have already done a conversion on the Peco Collett using my now proven solid split brass chassis method and using the original tender, but cut down to the correct height. 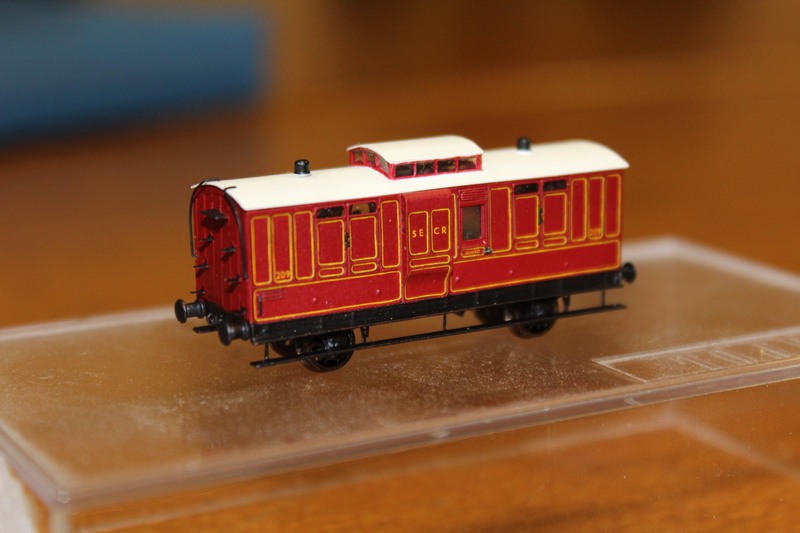 For this second version, the loco chassis is identical to the first, but I will use a Dapol tender. The loco body is one aquired from Peco by Roger Jones, so none of the mechanism is thrown away this time. So in the Proxxon MF70 mill goes the brass rod and plate. These are drilled and screwed together before the holes for the bolt bushes are drilled. This is shown in the main picture. These holes start as 0.8mm to allow the plate is tapped for 14BA screws. 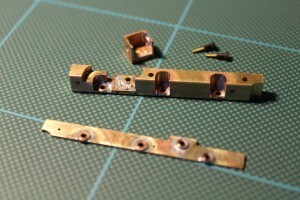 The holes in the block are then enlarged to 1.6mm and a recess of 2.5mm to take the bushes. The bushes are the ones developed for the Manor chassis kit, so anyone who has built one will know what I am on about. 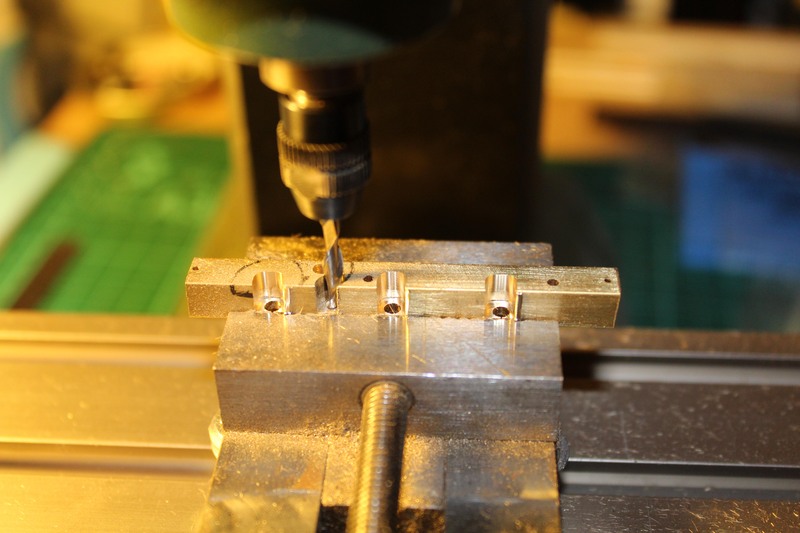 Once the two parts are secure, the axle holes are drilled to accept 2mm Scale Association bearings. Next the block will be milled to allow the muffs and gears room to move. I will do another post to show the progress on this. It may seem a risk to be making a chassis this close to the show, but it is a copy of a proven design, so fingers crossed. The second photo shows the worm mount part of the gearbox which will screw into the top of the main block. This method has the advantage of being able to quickly split the two parts when getting wheels quartered and gears meshed correctly. 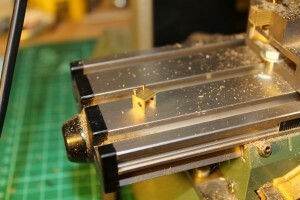 The box is milled out of solid brass and will take Association bearings in the large holes. Evening. 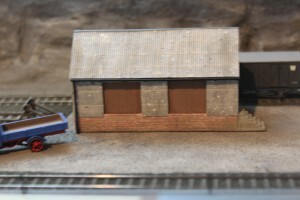 With the AGM fast approaching I needed to add goods facilities to Llangerisech without spending too much time on them. The original plan was to use a slightly reduced version of the goods shed at Llanidloes, thereby following the main station building and engine shed. It would have been a fairly sustantial structure and a bit of a squeeze in the space available. Having then looked at the Scalescenes small store kit, this seemed too small. So out came the books. C C Green's books on the coastal lines of the Cambrian are a superb resource and while browsing the first in the series, I came across the shed at Llandre north of Aberystwyth. It was a good size and could be quickly built using the Redutex corrugated iron sheeting that I had recently acquired. 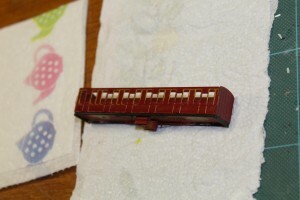 So a quick shell from mounting card, the door openings painted with acrylics and scribed wooden doors gave a good start. Scalescenes brick paper was added around the base before the roof and sides were clad in the Redutex sheet. The latter is self-adhesive, so they just need to be cut to the size of the base card and are then slapped on. Before you know it Robert is your mother's brother. A little finishing with steps and guttering and the whole thing had taken less than six hours. The gable end boards and step hand rails still need to be done, but other than that, it is complete. 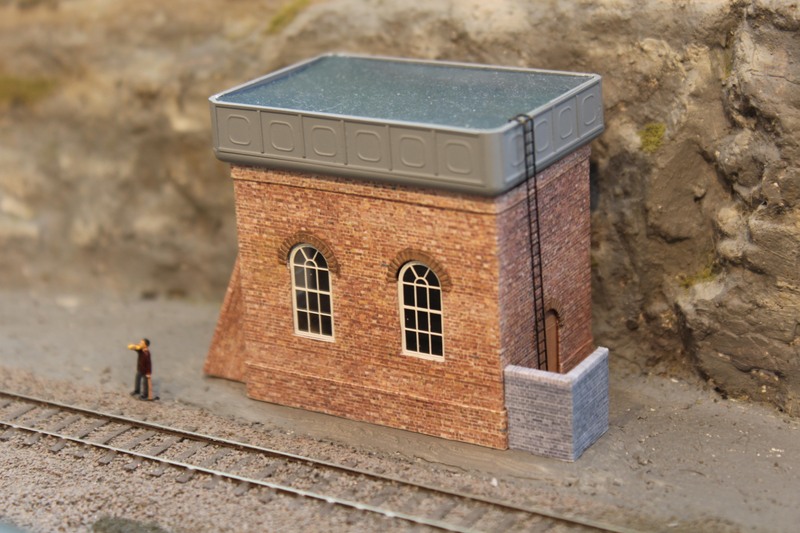 A little weathering powder helps to blend the brick paper, but very little is needed on the cladding sheets to produce the results pictured. The Redutex sheets seem excellent for this sort of application. They aren't cheap, but neither is my time, so overall they represent good value as such results are very quick. The shed seems to have the right parsimonious presence for a Cambrian station where freight plays second fiddle to the passenger services. So sometimes the organic approach to planning works! No - nothing to do with that dodgy 90's Mullet-sporting band Europe, but a few blogs in the lead up to the 2mm AGM and the Aldershot exhibition. Llangerisech is one of the four 2mm layouts that will be at the show and will be shown for the first time in its 1930's mode. 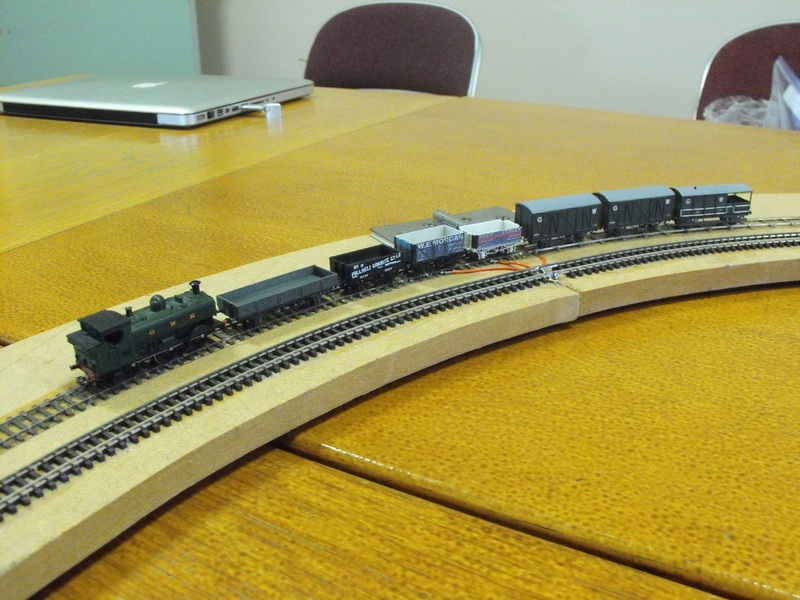 For that purpose, I have had to make the additional features required by a steam railway as opposed to the slightly rationalised items we have used when showing blue diesels. First up is the water tower. 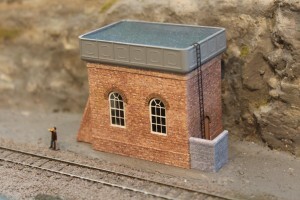 This is based on a version at Machynlleth, but is a fairly standard Cambrian brick built design. 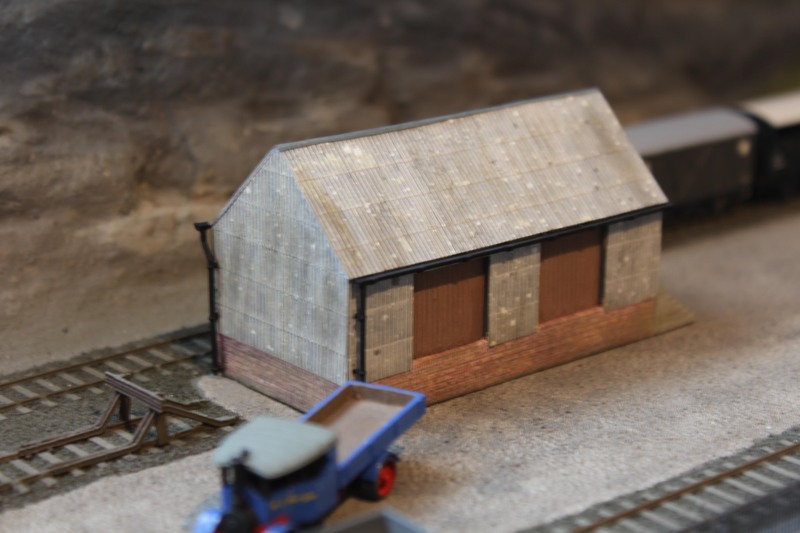 The Cambrian used similar tanks on timber supports, but as the shed is a reasonable size, I felt the more substantial version was appropriate. Biggest challenge was the pattern on each of the tank panels, but the old Robo Cutter came in very handy. I drew the shape on the computer and cut the rounded corner squares out of sticky-back plastic. 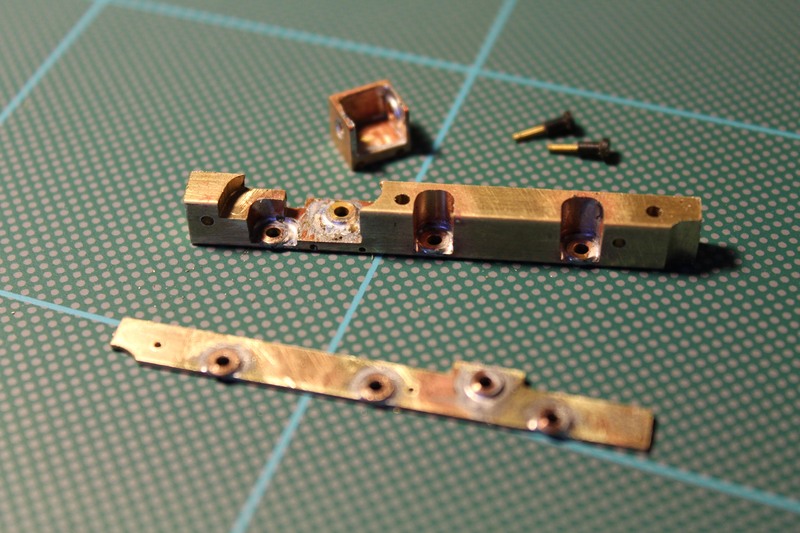 As the shapes are very thin, I had to cut out more than required and bin a fair few to get a reasonable consistency. These were then stuck onto the tank sides (made from platicard sheet and quarter round rod) before being sprayed. The base is simple mounting board with Scale Scenes paper and Scale Link windows. The water is old processed X-ray film (my Mum used to be a radiographer and I have a large stash). Over lead up to the show, I will show other bits of progress since the layout was last shown and some of the last minute panics. I hope to see you at the show on the 11th. Am I alone in making more progress in the immediate aftermath of an area group meeting than in the whole of the rest of the month? 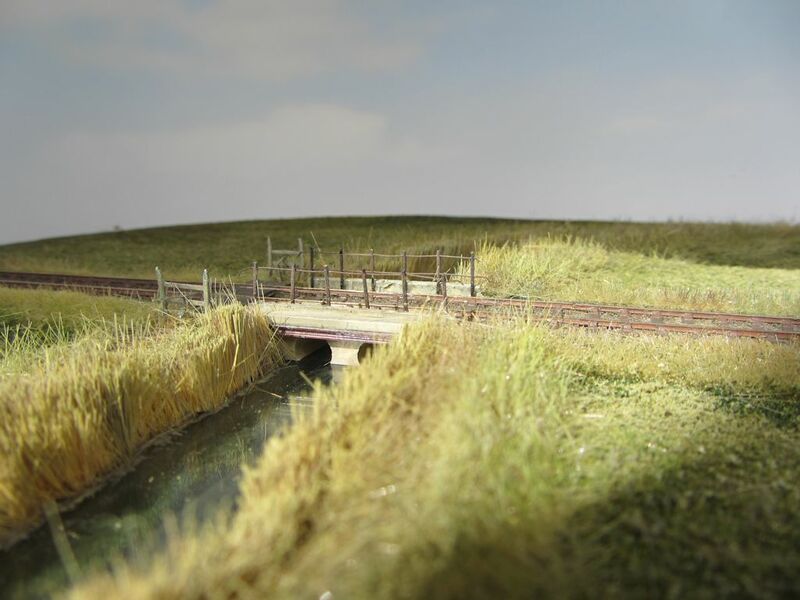 Following yesterday's dose of Wealden inspiration I finally got round to tweaking the single Turnout Operating Unit (TOU) on my "scenic test track" and spent a pleasant half hour running trains back and forward through the turnout. Simple pleasures, eh? This TOU has been an ongoing saga (though other Wealden group members will probably tell you that applies to anything I touch). It was built initially for servo operation but converted to manual operation when the servo board I was using gave huge over swings at start-up. 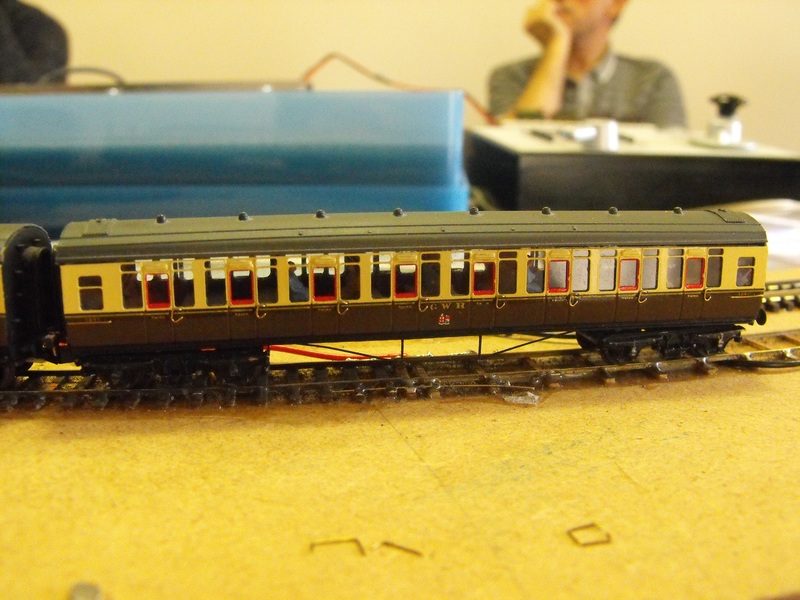 After building a fascia I didn't really want a piece of brass operating rod protruding through it, and having enjoyed the delights of running trains using Engine Driver on an Android phone, I wanted to control the turnout and magnets using DCC too. 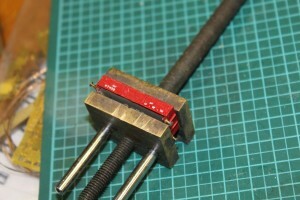 The TOU (below) is based on Geoff Jones' idea of telescopic styrene section. The droppers from the switch blades come down the tubes in the middle which have screws that slide in the slots just visible to provide plenty of scope for adjustment. 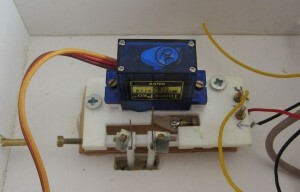 The dropper on the right is soldered to the metal L section as this switch blade has a tendency to lift. 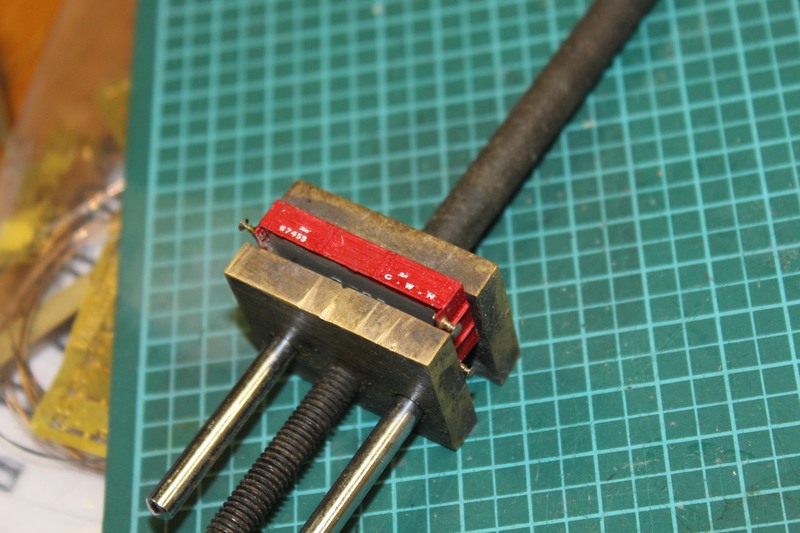 The screw on the left is left over from when the TOU was worked manually - the operating rod came through the brass tube just visible on the extreme left. There is a microswitch on the right hidden under the screws). This is worked from a screw just visible to the front right of the servo which is fixed to the slide bar and which can be adjusted so that the microswitch throws reliably. 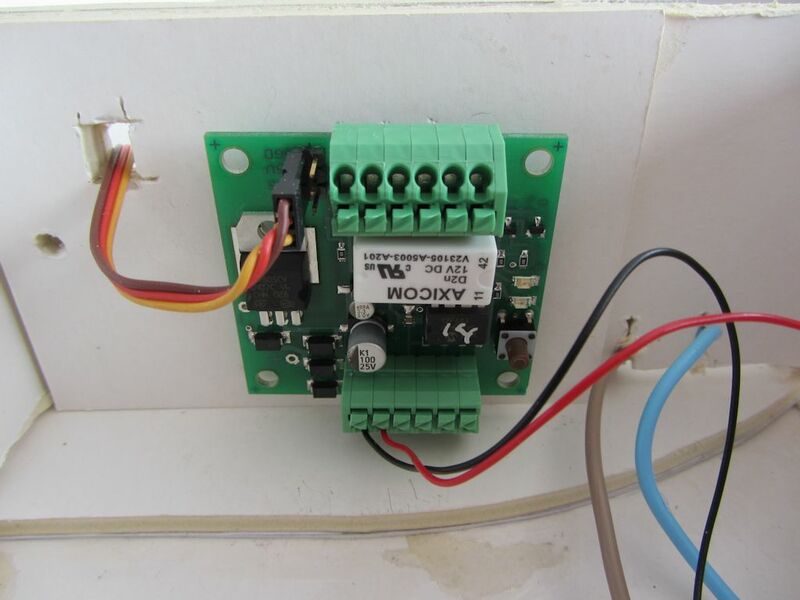 The microswitch also provides the return spring for the slide bar so that it is only necessary to precisely adjust the servo for one direction of travel. You can see the servo arm peeking out from underneath where an attached screw presses against the microswith screw and moves the slide bar. Much simpler to do than describe! The Team Digital Servette (above) drives the servo. This was purchased as it has a Relay with a separate DCC address that I planned to use to work the electro-magnets but when doing this I experienced occasional twitches of the servo when the magnets were operated that threw the switch blades to a different position - not what you want when propelling wagons over a turnout! These twitches were intermittent, perhaps 1 in every 10 - 20 throws, so debugging was a convoluted process. 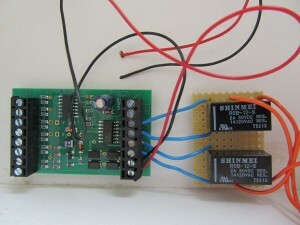 To start with I swapped to a spare NCE Switch-It that I had lying around (below) which switches relays that control the magnets. 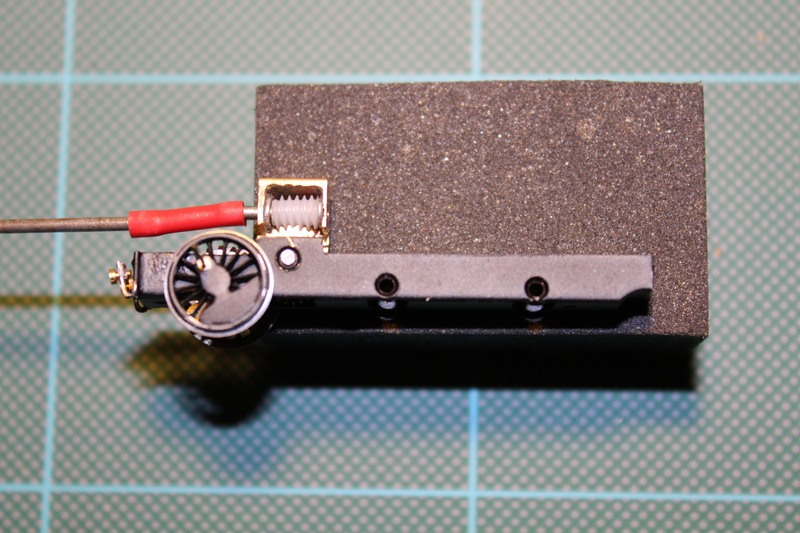 This on its own didn't help and after wrongly suspecting the proximity of the devices I eventually discovered that it was due to the leads from the magnets passing close to the servo. After moving the Switch-It to the other end of the board so that the magnet wires completely avoided the servo, the problem disappeared. What I should have done was experiment to discover just how far away the wires needed to be, but by this point I was just pleased to get it working! The picture below of the under side of the board shows the Switch-It at left, the magnets centre and the TOU and Servette to the right (plus a lot of messy wiring). Adjusting the swing of the servo was a doddle using JMRI and the adjustable dropper tubes made it easy to get the throw of each blade exactly right. 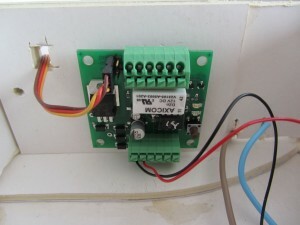 I have set up a small panel in Panel Pro which makes it easy to control the turnout and magnets. The reeds need tidying after being upside down for the above adjustments but I am quite pleased with the colouring. I am in the middle of creating trees for the background using dried stalks based on the Fencehouses article in MRJ though I really need to do the line side fencing first. The first chance to catch up after Christmas saw Dave making up etch bogies, Nigel making some door handles and Richard working on his computer. David showed some delicate etched kits although pictures of these have already appeared on the London Group blog. The test track was out mainly to run Nigel's locos, but Gareth's C class was given a couple of circuits. 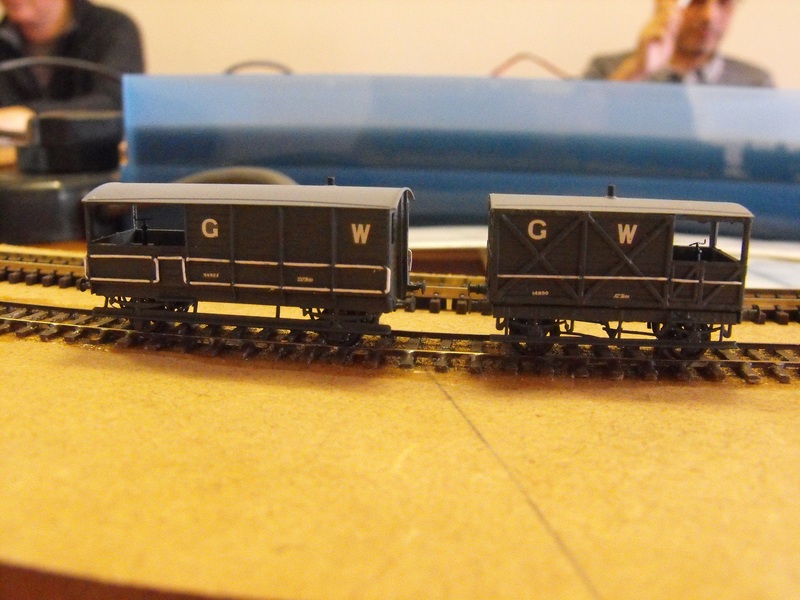 Gareth had completed two locos since we last met, while Nigel had been concentrating on rolling stock including Toplight coaches, private owner wagons and some GWR owned wagons. With the Aldershot exhibition in October as goal, more of the 1930's items will be needed to run that period. 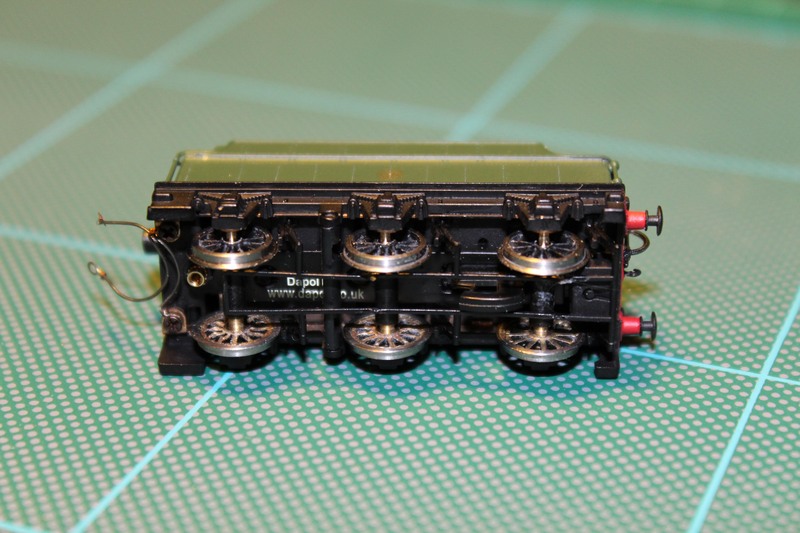 Gareth showed the internals of the green C class which uses a Farish 4F chassis and tender block along with a Nigel Lawton motor driving the loco wheels through the drive shaft. The black O class uses a modified Dapol Terrier as a tender drive unit and a fabricated loco frame. 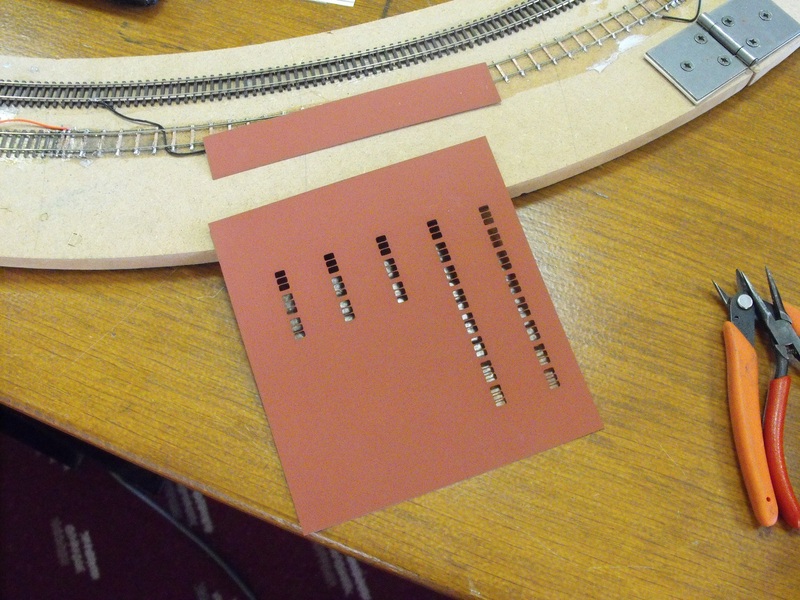 Nigel had used the Robo cutter to produce coach internals and showed the card with the cut outs before trimming to size and shaping to fit. The resultant interior is all card and very light weight. Various other wagon kits had been completed and were shunted round the track by the Pannier tank. This now boasts skid pick ups in line with the front steps so they are more difficult to spot. This was prompted by seeing Richard Wilson's version running extremely slowly at the November meeting at the MRC. 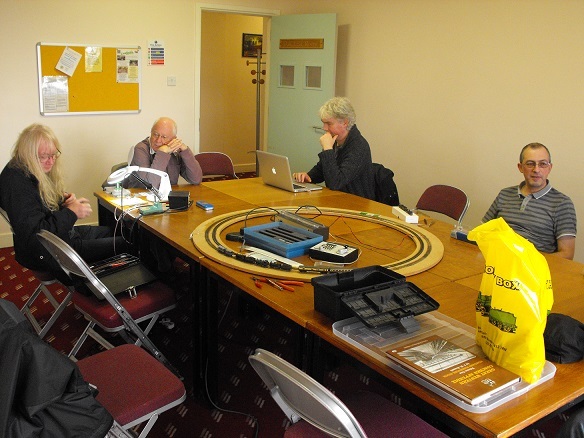 Bob and Peter also turned up to join in the conversations which inlcuded R Parker vehicles and BR standard locos. 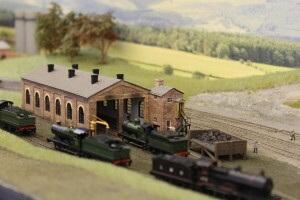 Next meeting is the 4th Saturday in February at the usual Uckfield location.